Trailing through IMDB recently, we stumbled upon a list of all Best Picture winning films from 1927 to 2015. This got us thinking ‘What could we do with all of this data?’. Here, we take an in-depth look into which genres are most successful at the Academy Awards. 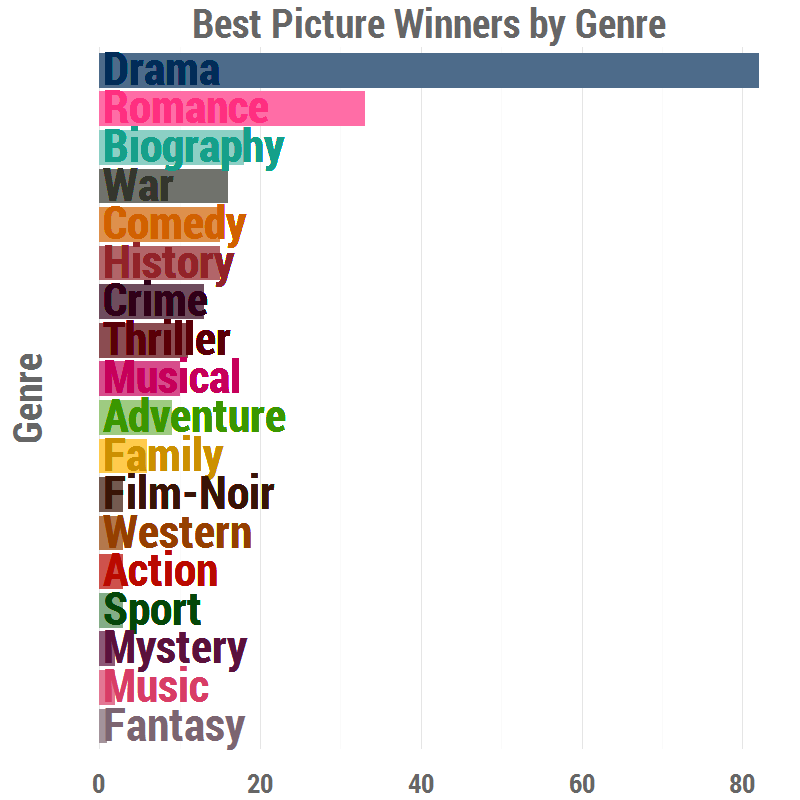 Here we can see that Drama is by far the most frequent genre of Best Picture winners, with more than double the entries of Romance films, the second most popular genre. However, Drama often seems like a ‘catch-all’ label, which is applied to many films in addition to other genre labels. Therefore, we need to look further into how Drama films are categorised. We can also see that the rarest genre for a Best Picture winner is Fantasy, with The Lord of Rings: The Return of the King (2003) as the sole representative for that category. Also rare are films labelled as Music, as the only two winners are Going My Way (1944) and Amadeus (1984). The distinction between Music and Musical, however, is not so clear, with Going My Way falling into both categories. There are notable genre absences among Best Picture winners, namely Sci-Fi and Horror. While no Sci-Fi feature has ever won Best Picture, two of the 2016 nominees, The Martian and Mad Max: Fury Road fell into this category. In terms of the absence of Horror, this appears to be more to do with IMDB’s genre classifications, as 1991’s The Silence of the Lambs is often credited as the first and only film to win the award. Although, whether this film should be classed as Horror or Thriller has long been a contentious debate. Looking at whether the genre of Best Picture winners had changed notably over time, we split the data up into decades, from the 1920 to the 2010s. From this, we can see that Drama is a consistently popular genre across all ten decades. In fact, it is the most frequent genre of Best Picture winners in every decade apart from the 1920s, in which it is surpassed by Romance films. It is worth noting, however, that the first Academy Award ceremony was not held until 1927, and therefore there are only three Best Picture winners representing this decade. Another noteworthy point is that although many films are categorised as Drama, few are categorised as Drama alone (these include All About Eve (1950), One Flew Over the Cuckoo’s Nest (1975) and, most recently, Slumdog Millionaire (2008)). This again indicates that Drama may be a somewhat general or vague genre, into which many films are categorised alongside other genres. The above visualisation does appear to show some trends in the genre of Best Picture winners over time. Firstly, we can see that Romance films were quite prominent from the 1920s-1950s, with fewer winners labelled as Romance films from that point onward. Although less prevalent in recent years, the 2000s are notable as the only decade not to contain a Best Picture winner categorised as a Romance film. Similarly, Musicals were quite frequent winners up until the 1970s, and only one Musical, Chicago (2002), has won in the years since. This may be set to change, however, with La La Land, starring Ryan Gosling and Emma Stone, tipped for Oscar success next season. Only a handful of films placed in the Family genre have received the Best Picture accolade, and this was between the 1940s-1960s. While Family films are by no means restricted to animated features, perhaps the absence of this genre in more recent years can be explained by the introduction of a Best Animated Feature category in 2001. Biography films have made up a larger percentage of Best Picture winners since the 1960s. This has been particularly noticeable in the past few years, as half of the Best Picture nominees for the 2015 Academy Awards were Biography films (Selma, The Theory of Everything, The Imitation Game and American Sniper), resulting in a plethora of articles condemning Biography films as ‘Oscar Bait’. And, with announcement after announcement of new biopics in production, the prevalence of the Biography film shows no sign of slowing down. Some genres seem to be localised to certain decades. The clearest example of this is Film-Noir, which had its heyday in the 1940s, but there have been no Film-Noir winners since. Other genres are consistently present throughout the years, but are less prevalent. This is the case with both Comedy and War; there is at least one War film in each decade except the 2010s, and one or two Comedies in every decade since the 1930s. 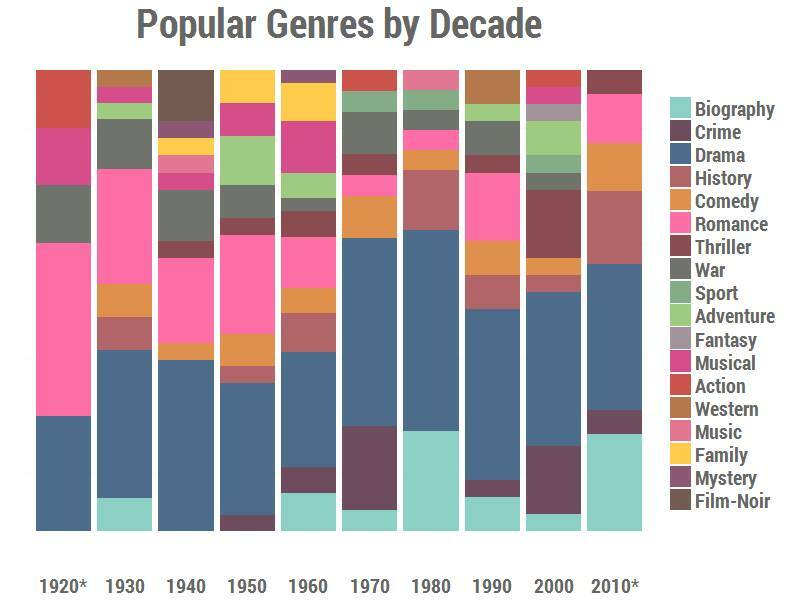 Looking at genre diversity, the 1960s and the 2000s have the largest spread of genres. Although it appears that the 1920s is the least genre diverse decade, again, there is only data for three years of films in this decade. Interestingly, there is quite a diverse spread of genres in pretty much every decade, suggesting that Best Picture winners are becoming neither more nor less diverse in their subject matter. Finally, we look to see which genres are most frequently paired together. 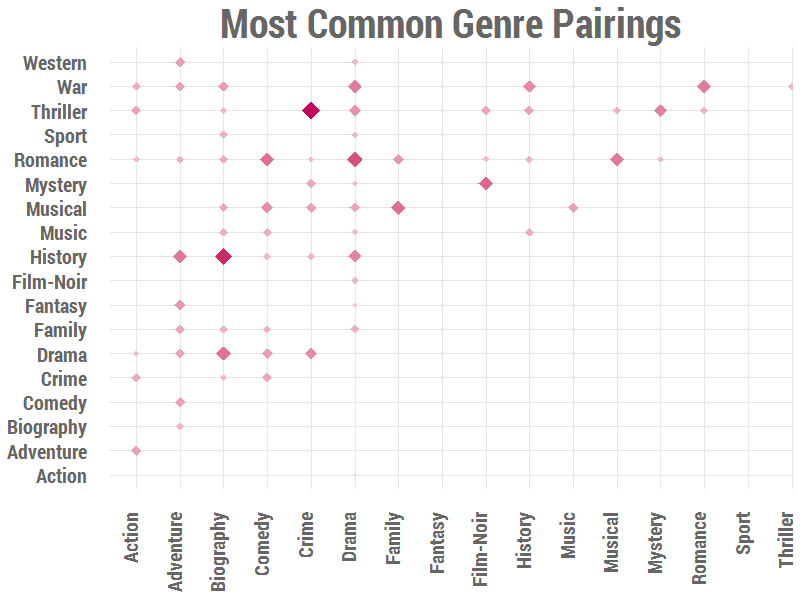 This illustrates that the most frequent genre pairing is Crime-Thriller. There are a total of 8 Best Picture winners which fall into this category, including In the Heat of the Night (1967), The French Connection (1971), and No Country for Old Men (2007). 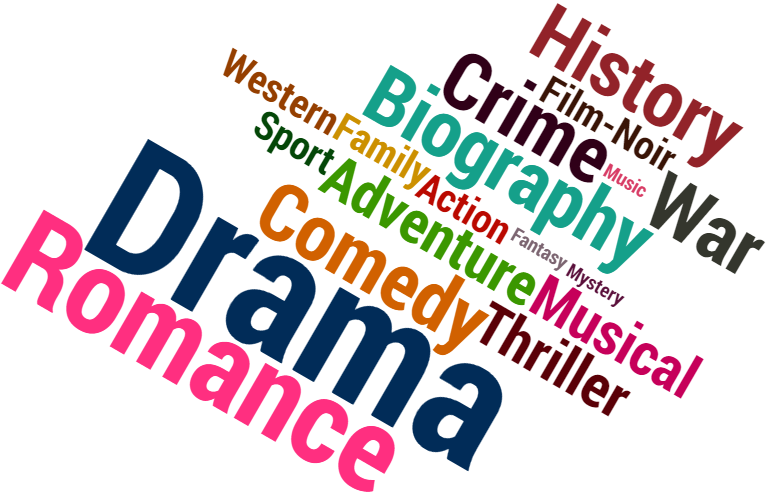 Other notable parings are History-Biography and Drama-Romance. We can also see which genres are less compatible with each other, at least in terms of Best Picture winners, despite how entertaining it would be for an Action-Musical or a Sport-Film-Noir feature to claim victory at next year’s Academy Awards ceremony. 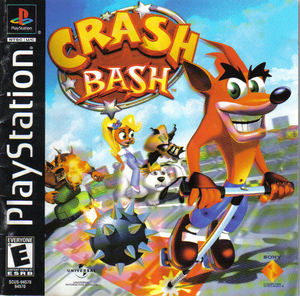 I played so much Crash Bash as a kid. When I tried to play it again recently, my *cough* emulated *cough* version was broken so that you couldn’t see the words in the menu. There was just a blank space where the words should be. But that didn’t matter, because I’d played the game so much when I was little that I actually remembered where all the words were supposed to be. So I listened to the beeps to know when I was changing to a different word in the menu, moving down, pressing X, knowing the default option was no, move left to yes. Knowledge I hadn’t needed in a decade. Still fresh. 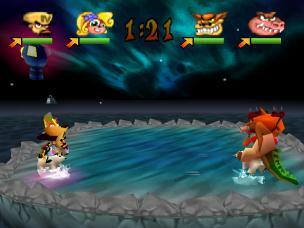 I look back on Crash Bash as the game I shared the most. Anyone I met, I made them play this with me. Some were good and we made progress, others just fell asleep mid game. Despite the mixed reactions from my childhood friends, I really liked this game. So, I wanted to find out if it was just as fun as I thought it was when I was little. After loading Crash Bash again recently, the graphics didn’t shock me. I look back at some old games and wonder how anybody, at any point in history, ever found them enjoyable. Like pretty much anything you’d see on the Atari. To me, these games just don’t look fun because of how primitive they are. But I know that people that enjoyed those games at the time won’t notice, they’ll just be transported back to their youth. Crash is the same with me. Maybe millennials wouldn’t derive much enjoyment from it. Maybe they think it’s too old. But not me. The sound in Crash is what transports you back the quickest. The funky upbeat tones put me straight back to 2001, in my bedroom with my PS1. You can’t deny they’d sound out of place in a modern game, but they still fit the vibe perfectly. It makes you happy, it immerses you, and lets you forget about the world. When I played this game by myself as a child, I remember getting really sad when the characters died. They’d fall down, and lie lifeless on the ground as their soul left their body to go to heaven, looking all sad as it floated up into the sky. I hated being reminded of the permanence of death as a child. That hasn’t changed now. There’s just no need to remind me of that. If Crash just stopped moving and the game restarted, it’d be fine. I wouldn’t think about it any further. But their souls actually leave their body. In playing Crash Bash again I was reminded of my innocence as a child. At the start of the game you’re given two random enemies who you then play against in every minigame thereafter. I never realised the significance of this when I was little. I just played happily against them. But now, rivalries are formed, vendettas taken out, and I have grown to hate every enemy. Tiny roaring as he puts a ball either side of my car or, Nitros Brio laughing after he zaps me with his stupid gun. Hate ‘em all. When I was young I used to love the ball/goal levels. You’d control a little cart and move on a 2D plane trying to stop balls going into your goal and get them in others. Now I can’t wait for those games to finish. The longer they drag on, the closer to existential crisis I get. I just don’t get how I lived for those levels. Now, they’re just frustrating. The less said about the level where you ride a polar bear the better. I can’t bear to think about the amount of times I’ve just propelled myself right off the edge after lining up a big hit on tiny. It’s a level where the Sound of Silence may as well be permanently playing. There isn’t much to say about the level where you throw boxes at each other. It’s fun but a little empty. I used to like the level where the floor disappears when you threw TNT’s. I’d try to troll the AI by remove as many blocks as possible, only to accidentally kill myself by falling down the giant floor holes that I’d just made. The pogo levels were never that interesting to me. When I was younger, I used to try and get as many squares painted as possible before I checked out with a box or completed the square. I remember once I lived the dream, circling the whole board, turning it all yellow and getting the full 64 points. No one ever believes me though. Playing it now, I tend just to play it safe. Get a few points and check out, steadily increasing. I’m boring now. It can be pretty frustrating when you get shot, or Tiny takes your box right at the end and you can’t check out. You never really get rid of those frustrations, you never feel like you can get revenge. Sure, you can shoot them, or take their boxes, but it just feels empty. It’s a 16 year old bit of code that you’re fighting. I used to hate the tank game. I remember distinctly that it always ended up you and an enemy tank, spamming the fire button. If I was going down, I was taking him with me. Or more often I was getting him to his last sliver of health before he finished me off and 2 v 1’d my friend. Playing it now, I really enjoy the tactics of these games. It was much more in depth than I thought. Bombs drop, health pick ups, taking cover. I was so stupid just to lock horns. I mainly played the game with friends for one night, so I never got to see much of the later levels. Playing it again with more time and more intelligence I finally got to appreciate these levels. Appreciate them for the insanely hard, frustrating RNG fest they are. Okay, the wee car one where you go round in circles is alright, once you get used to it, not much to say. But the one where you collect balloons feels almost impossible. Tiny is always hooving up the balloons, kicking you as soon as you get a power up. We played for hours and barely won. I used to find the bosses very immersive. I thought they were a good end to the levels, something grandiose and imposing. But looking at it now, they’re not really. They’re one dimensional levels with a narrow win condition that you just have to do a few times with very little changing tactics in between. Especially Papu Papu and the Bearminator. I didn’t care much for the gems and crystals when I was little. I kind of resented being walled off from the rest of the story because I didn’t have enough purple gems. I mean, I’d done the requisite levels, why can’t I just go to the next floor? But now I appreciate the different win conditions and handicaps. It adds a challenge to the easier floors and allows you to revisit the game and it still feels fresh. In conclusion, the games I thought were fun aren’t that fun. The games I hated as a child turned out to be alright, and the balloon one is still stupid. So I guess it all levels out. I’ve always found it hard to get into games. I get overwhelmed by everything there is to do. I know it’s stupid, and that it’s a good thing games have so much content now. I felt stupid playing Bioshock. I felt like I had to force myself to keep going. I looked up how long it took to beat the game and I counted down the hours. I enjoy the story and I love the setting, but somehow it still felt like chore to play. Some games are completely different. I just can’t stop playing them. Mornings turn into afternoons turn into nights. The later it gets, the more often I hear myself saying ‘just one more turn’. 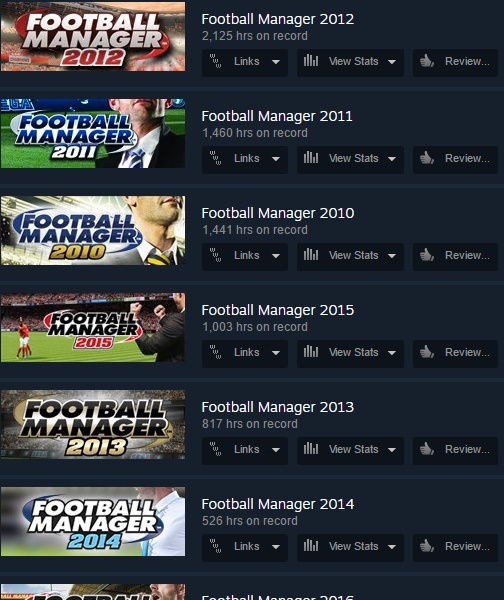 The first game I got this feeling was when playing Football Manager as a child. I was brought up in the north of England and forced into watching and playing football as soon as I was sentient. Although I have a lot of disdain for the culture surrounding the sport, I can’t deny that I’m passionate about the sport. I have a Steam account because of football. Specifically, because of Football Manager. I played it well before it was even on Steam, and I remember resenting the game for forcing me to sign up for Steam. I didn’t know how much I’d be using Steam later. I wish I had known the permanence when I named my account over seven years ago. I played Football manager for way too long. Way too long. I may have resented Football manager forcing Steam upon me at the time, but it proved to move me from the console to PC. Then I started watching gaming videos, and I’d wish I had a Steam account as impressive and extensive as I’d see on YouTube. I dreamed of having a scroll wheel on my account one day. Think about it, so many games you’d actually have to scroll through to find what you want. One of the first games I played after moving to PC was Civilisation V. I never felt overwhelmed by huge amount of content the game had to offer because it gave me a feeling I was very familiar with. I always wanted just one more turn. From the offset, you always want just one more turn. You’re building a scout and there’s 6 turns until it’s ready, so how can you sleep until it’s done? In the meantime, what will your warrior find in the fog of war? There’s so much going on each turn that you need to keep playing to see it resolved. 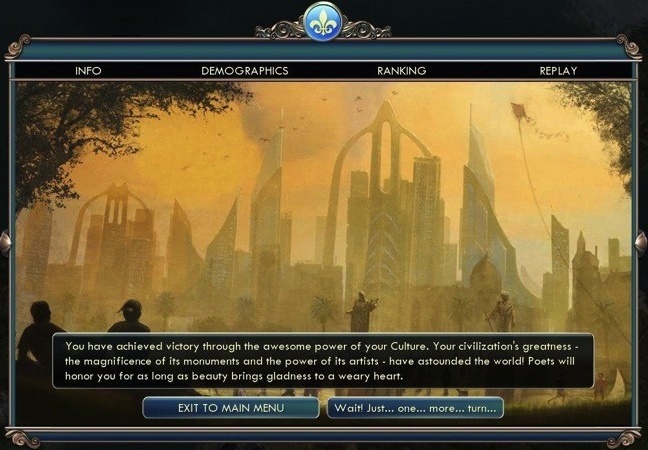 Civilisation V actually makes reference to this feeling on the victory screen.You can choose to exit the game, or to keep playing for “just…one…more…turn.” I don’t recall ever just exiting. How can I leave what I’ve been building for so long? I must see the resolution of my glorious civilisation, see them conquer the flat earth. Or at least drop a nuke on my rivals before they destroy me after I coward my way to a culture victory. By the time I’d left home and gone to university, my Steam account did have a scroll wheel. I owned much of Steam’s back catalogue through Humble Bundles and frugal gaming websites. At this point, I moved on to looking towards indie games. The ability to be niche and still be successful is the real advantage of the first world. Games about sending soup to other galaxies, talking russian dolls, babies that fire tears to defeat mega satan, and even a game about making games. Game Dev Tycoon was the first game I played where I shared the ‘just one more turn’ feeling. After showing Jasmine the game one night, we thought we’d play for a while. It’s a very easy game to start playing, you just pick a genre and platform, name your game and you’re off. It doesn’t sound like the type of thing that you’ll play for long. But sure enough 3 AM rolled around, all the biscuits had gone and we’re wondering how to save the company. Why are we still pouring so much money into our failed Blueno console? Why are our staff so needy for holidays? But we can’t lose everything we’ve built, so we churn out just one more game. The most recent game to evoke this feeling from me was Stardew Valley. But this time it felt a little different. I had read what the game was about, it sounded cool, so I bought it. I enjoyed the intro and named characters and gave my farm the cool name, “Lost Corner Farm”. I played about 20 minutes more before I began to feel overwhelmed so then I closed the game. I knew Jasmine would like it, though. So as soon as she was back I told her about it, and she thought the game was cool despite my stupidly named farm. After a rename was requested, I suggested that we just start a new game. Like it didn’t matter that she thought so little of my cute farm name. Playing Stardew Valley together was a whole different story. We both enjoyed different parts of the game, and when we each focused on these different elements, it began to seem a lot less overwhelming. Not long afterwards, we were hooked. I think we’ve owned the game little under a week. We’ve played 36 hours. I’ve never experienced a game with so much to do. Farm, explore, socialise, mine, fish, cook. Almost everyday is something new. Some days you want to fish but it’s somebody birthday and you need to get them a gift but you wake up and your crops are ready so you need just one more day to get your farm in order. But then tomorrow there’s a festival or Clint needs you to bring him an iron bar, even though he’s the town blacksmith. So, now you need to play another day to satisfy your ambitions, but you’ve played so long now it’s nearly the next season. Then you can plant the next season’s crops and get this season’s fish. The just one more turn feeling is strong but playing together completely changes this feeling. Instead of being stuck, glued to the screen, not bothering to take care of your most basic needs, you can just hand over the controller, take care of yourself, and watch someone else play for a while.